North American Finalist Jason Yun shows his sense of humour in the showcase below! The full outfit is actually not pictured because this photo was taken as a parody on the popular “Old Spice Body Wash” commercials. But in a way i think that the body is also part of the cosplay, and in order to build my shoulders, and taper my body to a sort of inverted triangle, i had to follow a strict workout and diet routine that would build the proportions i needed, while maintaining a low body fat percentage to show muscle definition. I was around 145lbs when this photo was taken, and it was taken on top of Yosemite Upper Falls in California, which is an 8.6 mile long hike with a very high rise in elevation. I actually chose this photo because oddly enough, on my Deviant Art account, it is my most viewed and most favorited photo, lol, go figure. I chose this outfit because it also displays forming my body porportions for a cosplay. 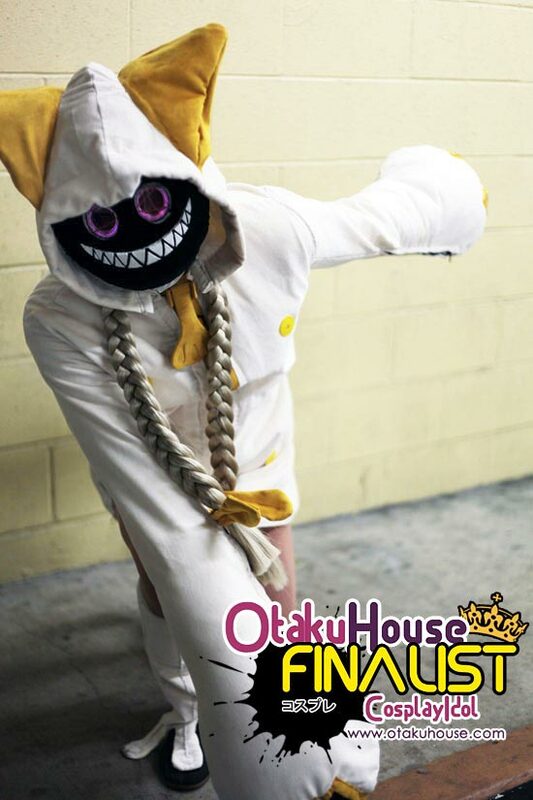 Since Taokaka is a female i had to drop quite a bit of muscle so that i weighed around 135lbs at the time. It trimmed my waist down to 25 inches. I also had to build up my leg and hip muscles so that my hips would measure in at around 35inches to give a more feminine shape. A lot of my muscle in my upper body was dropped, and the outfit itself was tailored for someone who’s proportions are 36D, 25, 35 for chest/waist/hips. The mask is crafted out of Wonderflex, then a stretch velvet was wrapped around it. For the eyes, i actually cut the front of a snowboarding goggle off, and carefully placed EL-wire in between the two lenses of the snowboarding goggle. This would give the eyes a soft glow. I also added a switch into the EL wire setup so that i could change the expression of the eyes to Round eyes ( 0_0 ), and also distraught eyes that look like ( >_< ). I wanted the teeth to stand out a little bit on the mask, so i used a wonderflex smile, and carefully sculpted 3D teeth using Paperclay, and attached the paperclay teeth onto the wonderflex so that the teeth would have a 3D design to them. The outfit itself was also made out of a Velvet because i thought it would look better then using a material like Fleece. Because it was velvet, i also had to interface the velvet, and line it so that it would hold its shape. The ears actually have a set of solenoids in them, and using 18V’s of power, the solenoids would move downward, and allow the ears to twitch by using a microswitch which ran down the sleeve and into the hand via an electric wire, to complete its circuit. This was created before i had a sewing machine so around 300 yards thread was used to hand stitch this outfit. The ponytails are attached to the neck of the outfit itself, and its made by using 2 sets of 48 inch weft extensions each. The paws are stuffed with polyfil in order to give them their plushness, and a zipper and velcro are on the inside seam of the paws so that the hands could be taken out of the cosplay, so that i could still have the use of my hands. I chose these photo’s because i wanted to show a little bit of a goofier side of cosplay, and also to display changing the weight and proportions of my body physically in order to better suit a cosplay. The sword took the most time to construct, and you can see the sword split into all 6 pieces in this photo. Its mostly made of 3 ply plywood, and reenforced on the inside with Pine stripping, since to make it lighter the insides had to be hollowed. The handles are made of Oak because the handles needed to be stronger to support the weight of all the swords. Any hinge system on the sword is made of aluminum so that it could stand the wear and tear due to hinges being moving parts. The outfit was one of my first attempts at using a sewing machine, and it was made of a black polyester wool fabric, since in the advent children series, you can see a texture on the outfit that cloud wears. The Pauldron was made using wonderflex, then using 3M super 77 spray adhesive to affix an Upholstery Vinyl onto it to give it a leather look. Their is a wolf emblem that is covered, but that was hand sculpted by using a paper clay. The Wig was actually created by buying 2 of the same wigs, and moving the wefts on one wig to the other wig to give it enough volume to spike up. The wefts were also attached facing in the up direction so that the hair would be easier to spike. 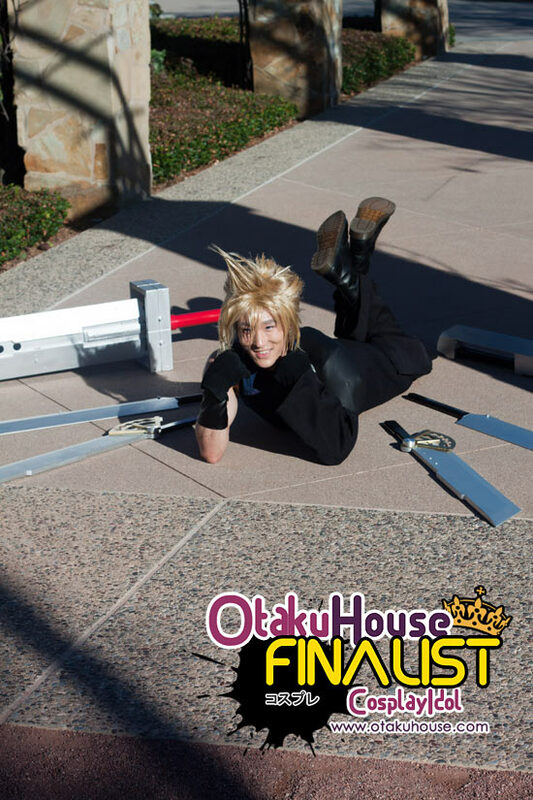 I chose this photo because it shows the swords, and i think its a goofy photo of what would really happen if Cloud tried to use Omnislash, lol. 6 swords and 2 hands, its just bound to fail. 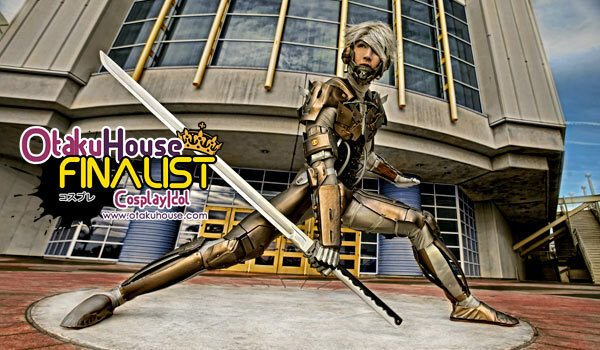 Jason highlighted the light side of cosplaying. 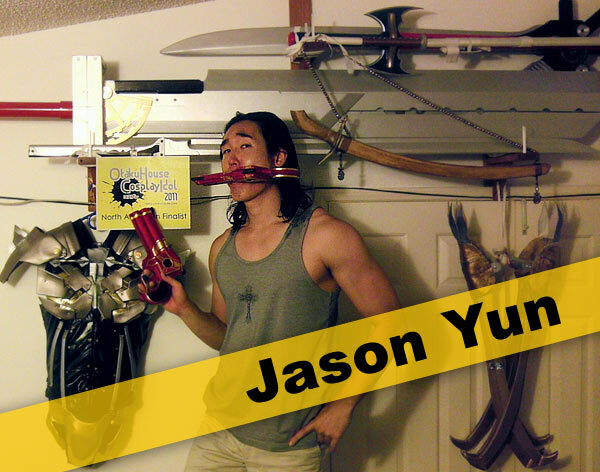 If you like his style, support Jason at the top of the page by clicking ‘like’ or ‘Google +1’!